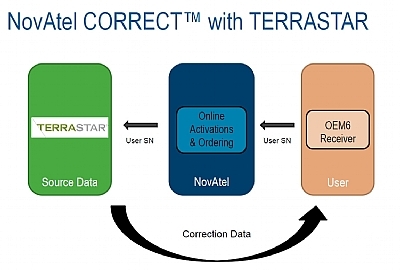 Novatel CORRECT positioning with TERRASTAR® eliminates the need for local base-station infrastructure by using PPP corrections delivered via TERRASTAR’s® satellite-based L-band communications network. TERRASTAR® is a subsidiary of Veripos, one of the leading providers of satellite-based GNSS precise positioning, which operates its own network of more than 80 GNSS reference stations worldwide. TERRASTAR® has an OEM business model that allows NovAtel to sell the TERRASTAR® correction service directly to its customers for land, airborne and near-shore applications.